This fully funded transitional year will provide an ideal opportunity for new doctorate recipients to prepare for an increasingly competitive job market by furthering their research, expanding their teaching portfolio, or exploring career opportunities outside the academy. 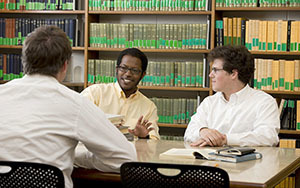 Professional placements open to postdoctoral fellows will include digital humanities internships, library internships, editorial assistant positions at the University press and academic journals housed at the University, internships with the University development office or placements with scholarly organizations based on campus. This year’s first class of 5+1 postdoctoral fellows will take up placements at the University of Notre Dame Press, University Relations, the Rome Global Gateway and a teaching exchange at the University of Heidelberg’s Department of American Studies. Additional placement opportunities will possibly extend to off-campus museums, libraries, foundations or arts and humanities organizations. Arts and Letters doctoral programs are also committed to shortening doctoral students’ time to degree, ensuring the five-year dissertation goal is attainable by reviewing and revising their programs. Jon T. Coleman, professor and director of graduate studies in the Department of History, said the program provides an essential incentive for both students and departments to ensure a doctorate is completed in the funding window provided. The College of Arts and Letters plans to share the results of its new initiative with graduate programs at peer institutions across the country. Notre Dame will serve as a convener of conversations about graduate education, curricular development, professionalization and new models of postdoctoral support. Originally published by Josh Weinhold at news.nd.edu on July 13, 2016.